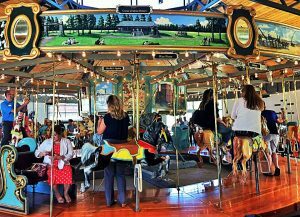 The long-awaited new home for the historic Coeur d’Alene Carousel opened with a ribbon-cutting ceremony on June 9th. This charming structure is across from City Park, next to Memorial Field. From 1942 to 1975, this same carousel occupied a primary place at Playland Pier, an amusement park where Independence Point is now. The park was dismantled around 1974 and eventually the buildings were burned. The much-loved carousel, which had been hand-carved in North Tonawanda, NY, disappeared to destinations unknown. Playland Pier. Photo Courtesy of the Coeur d’Alene Carousel Foundation. The intact carousel resurfaced at an auction in Puyallup, Washington in 1986. Duane and Carol Perron purchased it and added it to their carousel museum in Hood River, Oregon. After restoration, the carousel travelled many places for hire, including Vancouver, B.C., Pennsylvania, and Virginia. 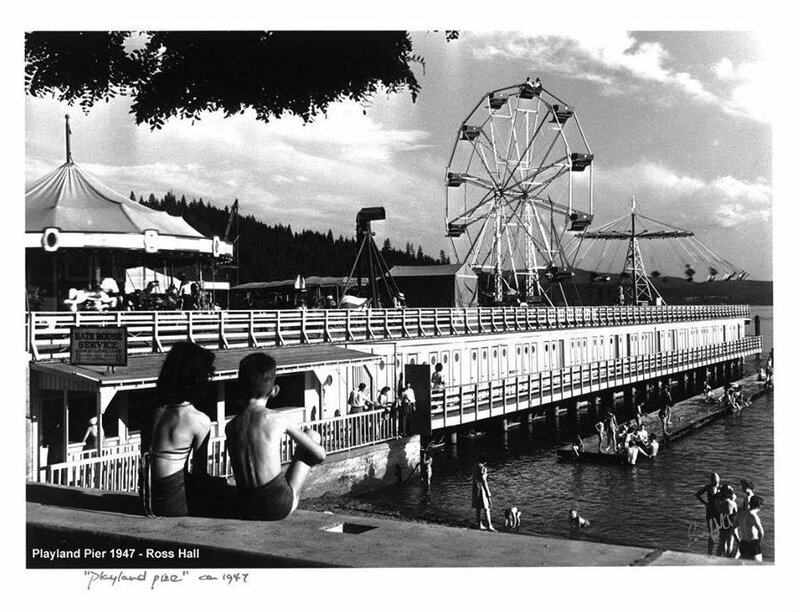 In 1996, artist Theresa Mather was commissioned to repaint the panels; she used photographs of the Coeur d’Alene area for inspiration. After seeing an article in the Coeur d’Alene Press about the carousel in 2011, John and Pat Foote purchased it for $250,000 and gifted it to the newly-formed Coeur d’Alene Carousel Foundation. A search began for a new location for the historic carousel. In 2015, the City of Coeur d’Alene agreed to lease a space in the newly-formed Four Corners Park where it now resides. Fund-raising began and Bud Ford pledged $200,000 towards the project with matching grants. Many local residents who remembered Playland Park fondly were enthusiastic about donating to the Foundation. 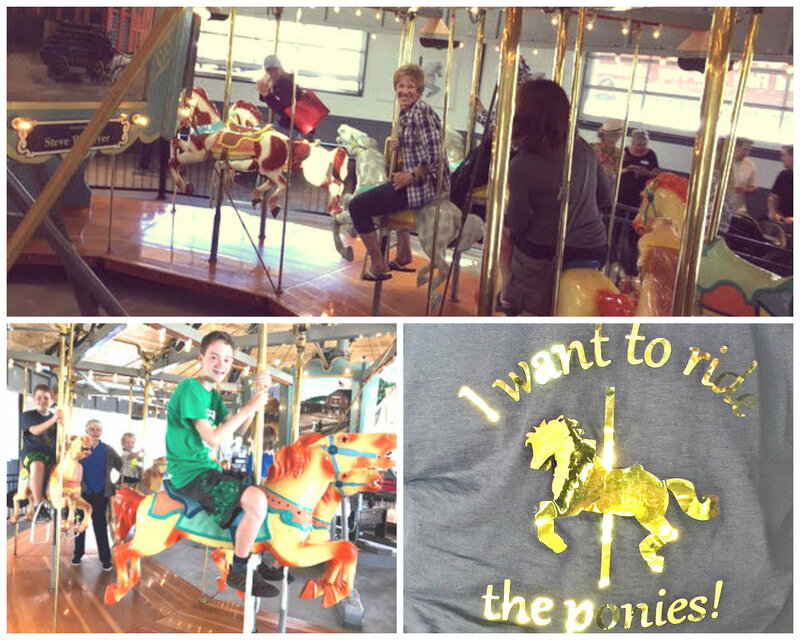 The Kootenai County Democrats helped make this revival of the old carousel a reality with our donation of $2,200. We have two 16″ x 16″ tiles with our logo with many of our valued members’ names etched on them. They, and other community tiles, will be set into the floor around the apron of the carousel. Top: Bev Moss. Bottom Left: Paula Neils and her grandchildren. Bottom Right: Promotional T-shirts. 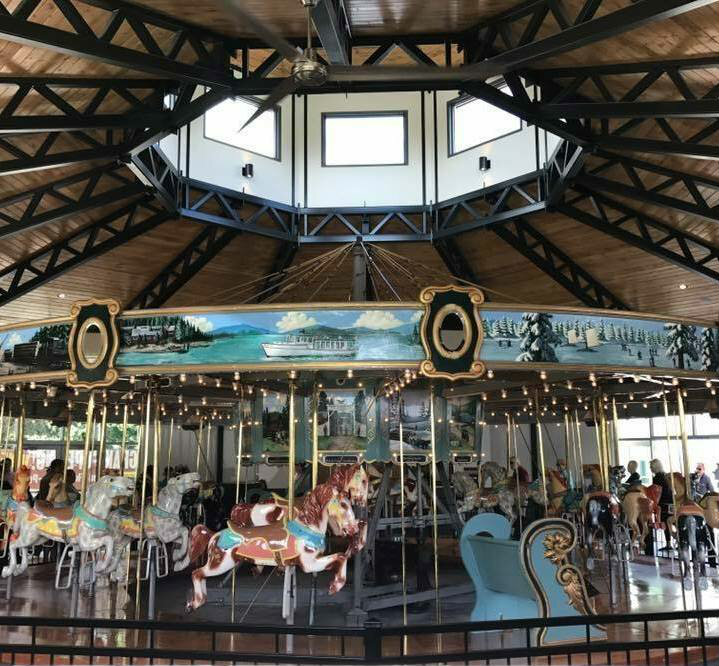 You can visit the carousel with your family Monday through Saturday, 11:00 a.m. to 6:00 p.m. and on Sundays from noon to 5:00 p.m. Tokens are $2 and can be purchased from a machine inside the building with cash or credit cards. Lisa Nunlist, Bev Moss, and Paula Neils spearheaded the project to put our name and brand in the public eye. The building is still developing, but someday soon you will see our tiles and be proud of our “footprint” in our community. The Coeur d’Alene Carousel will be a delightful family attraction for locals and visitors for decades to come.